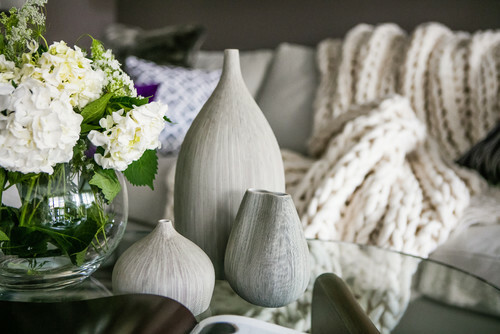 Living room decor is all about bringing pieces into your space that will highlight the beauty of your furniture. Decorations tend to be forgotten once you purchase your furniture but in this article we will discuss the importance of this 11 room essentials. These items will make your living room look like you hired an interior decorator. If the room’s existing lighting is a bit dim, adding some lamps could make a big impact. Also consider the idea of investing in new overhead lighting . Installing track, rail, or cable lighting to your ceiling will give the room a very modern look and make lighting objects around the room and on the walls a simpler and more flexible task. As the place you go to unwind, chat with friends and family, and entertain, the living room has to walk the line between great style and utter comfort — not always such an easy task. 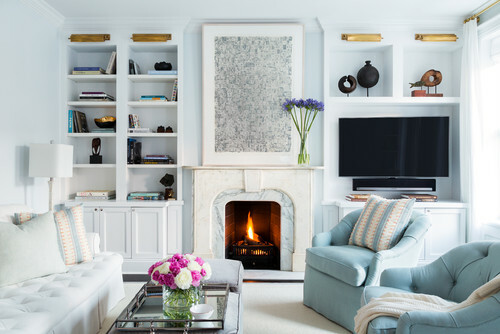 Whether your living room just needs that finishing touch to bring everything together or a bit more help, these decorating ideas can create a space you will be proud to show off and happy to come home to. 1. Get the right-size rug. A plush rug underfoot feels comfortable and welcoming — and when it comes to living room rugs, bigger is definitely better. A rug that all your furniture can sit on is ideal, but at least the front feet of each main piece of furniture should be on the rug. If you already have a too-small rug, you can always layer it on top of a big (less expensive) solid color or natural fiber rug in a neutral hue. Tip: Most standard-size living rooms can handle an 8-by-10-foot rug, so unless your living room is especially tiny, consider springing for an 8-by-10 (or larger) rug for a really comfortable, finished look. Larger living rooms (like the one shown here) may need a 10-by-12 or even larger rug to properly fill the space. 2. Customize your shelving. A wall of shelving, whether custom-built or free-standing, is useful and makes a design statement. Floor-to-ceiling shelving also works surprisingly well in a small space since one large, perfectly fitting piece makes a room look more spacious and less cluttered than multiple smaller pieces would. Tip: Consider adding a mix of open shelves and closed cabinets, so you can hide items that are less attractive (like a video game system) behind closed doors. If you are using free-standing shelving, be sure to have it properly anchored to the wall for safety. 3. Hang a low pendant. An oversize pendant light makes a welcome change from the usual mix of floor lamps and flush-mount ceiling fixtures. Hanging the light low over the coffee table creates a warm and convivial conversation area that beckons people to sit and stay awhile. 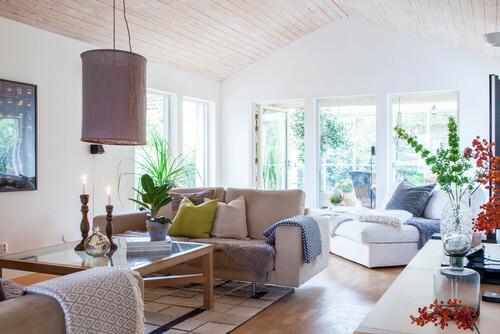 Tip: If you like to frequently rearrange your living room furniture, a low-hanging pendant light is probably not the best choice. No one wants to run into a random light fixture while trying to traverse the room! 4. Style up surfaces. A mix of three elements — flat, vertical and organic — is what you need to create arrangements that go above and beyond the usual stack of books. 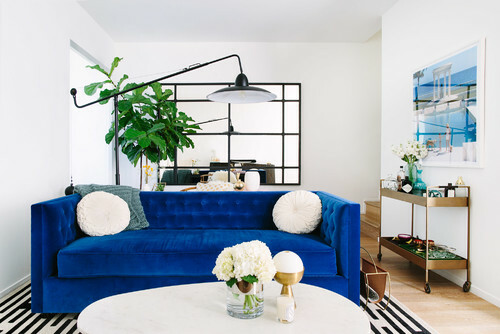 Try this formula to style surfaces like console tables, shelves and coffee tables. 5. Try a new sofa shape. The shape of your sofa sets the tone for the living room. Higher, more structured sofas (like the chesterfield) are generally more formal, while lower, squishier sofas tend to give a more laid-back vibe. Low modular sofas (like the one shown here) are perfect for lounging and can be reconfigured to suit the activity. You could face them all one direction for movie night, for example, but turn them to create multiple conversation areas for a party. 6. Give your old couch a new look. Instead of splashing out on an all-new sofa, you could give your old couch a makeover instead. 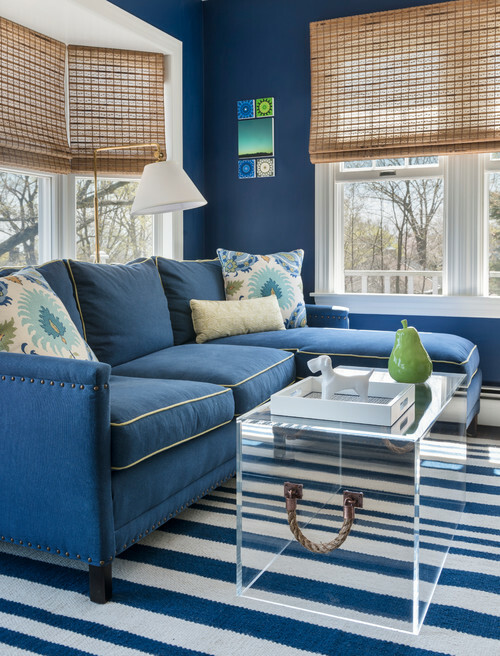 Check with the manufacturer to see if any slipcovers are made for it; if not, you can hire someone locally to create a custom slipcover for you. Or, for a really quick change, take a gorgeous textile (like a Moroccan wedding blanket) and drape and tuck it over the back of your couch. 7. Save floor space with sconces. Actually, sconces do more than save floor space: During a party, when you want to create a moodier atmosphere, direct the sconces to shine on your artwork and bump up the light elsewhere with candles. 8. Tighten up the color palette. A well-defined color scheme can make your living room look cleaner, more organized and intentionally designed. Decide on one background neutral color, one feature color and a smaller accent hue, then get to work ridding your space of any items that don’t fit within your selections. Tip: Take a photo of your living room to get a fresh perspective. When you look at the photo, the colors present in your living room will be more apparent. 10. Expand the space with a massive mirror. A large mirror is, in essence, like adding another window to your room, making your living room feel lighter and more spacious. Boost the effect even more by positioning plants or a lamp in front of the mirror to reflect greenery and amplify the light. 11. Take the focus off the TV. If your room has a beautiful fireplace, let that be the focal point. And if your living room is the only space where you can put the flat screen, position it to the side on a swivel mount, rather than above the mantel. That way you can still comfortably watch TV when you want, but when it’s not in use, the screen can step back from center stage.